Since I did not begin college until I was 25, I did not really have a typical college experience. I am very individualistic as that type of thinking has been engrained in me since I was a youngster. I find it interesting in my own parenting I often tell my son to “be a man” “do it yourself” and have taught my daughters to be self-sufficient individuals. It’s just who we are. I think many of us do this without even thinking about it. Do I think this is a problem for college students? It might be for some, but again, I just think it is who we are as a people. I do not think it is necessary to be a one-man show to keep students engaged, in fact, what I have found is that when I try to do that, it normally works for about 15 minutes, then the glossy eyes appear! I think the traditional lecture modality should be a small part of how content is delivered. When there is no participation in my lessons, I will change direction and get the students involved. I have been known to change direction mid-stream if something is not working. I will often tell my students “this is not working! We are going to do something else!” When I first started teaching I thought that every lesson must be perfect and precise! Now I realize that sometimes my plan just doesn’t work out. Flexibility in the classroom is very important to me! That’s why I probably wouldn’t make it in a setting where everything is precisely scripted! Thanks for the interesting summary Jessica. I enjoyed it. Although I began taking college classes as a senior in high school, my college experience was very individualistic. My focus was to complete my classes and graduate so I could be successful on my own. Based on my experience, I feel that many freshman and sophomore undergraduate students are split into two types of college students: those that come just to study and those that come to have fun. I did not see the merging of these viewpoints until students became juniors and seniors. I think that this could be an issue for our college students. Although I agree that some individuals approach college through an individualistic nature (such as myself), I wonder if the individualistic nature mindset has any impact on student success at college. My experience with teaching undergraduates is that it is not necessary for the instructor to act as a one-man show in order to keep students engaged. However, more effort has to be made on the part of the instructor to engage students in the learning. This can often be done through class discussions, relating the material to the students, and in class small collaborative projects. I was primarily schooled in a private, small school environment. In some cases, my school experiences were individual. But, more often than because I was in small schools and classes were small the activities, assignments, and discussions were quite collaborative. Having these experiences in small venues was quite beneficial. I feel that it is beneficial to have an individualistic approach to school, but it can be costly. It is important in organizations to be collaborative, to invite perspectives, and to develop teams. My current job and world is about building effective teams and achieving goals collaboratively. Again, it is important to not diminish the role of the individual working independently, but in many cases it is about what you can bring back to the team. Because my experiences were diverse in school I find that this is an effective approach to teaching at any level. A “one-man show” is not an effective approach. I equate a one-man show model to direct instruction and there is only one direction information is flowing, from teacher to student. With some information and aspects of teaching it is important to use this approach, but to teach students how to be effective members of organizations and society as a whole it is important to utilize many approaches. I find in my adult life, people tend to want to work independently, as opposed to working in groups or teams. I find this to be a weakness. Let’s face it, it is more work on the teacher and the leader of an organization to develop teams and collaboratively work together. But, the genuine hard work will pay off in the end. I find it interesting that you were primarily schooled in a private, small school environment where the activities, assignments, and discussions were quite collaborative. Did these experiences also have any elements of an individualistic approach? Do you lead your school through more of a collaborative approach? I would think that it would be essential to do so since you are the principal of a charter school. Although I was raised in a very individualistic schooling system, I do feel that both elements are essential for reaching all learners. In my classroom the majority of the class activities, assignments, discussions, and projects are collaborative with supervision. I went to school in Milwaukee, WI and, unlike many of my peers at the time, I commuted during my freshman year at Marquette University. In that sense, I’d have to say I had a very individualized college experience. Instead of arriving in pajamas, I’d be in business casual because I had a job down the street. Instead of staying up late in the dorms and complaining about the food, many times I was home with family and friends from high school. I think it is interesting to note that, much like the international student population Jessica mentions, I could identify many of the differences between myself and many of my peers. However, I moved into an on-campus apartment for my sophomore, junior, and senior years of college and realized that I understood why someone would go to class in pajamas…because they could. I can’t say that I changed much, but I had the same realization that the author did. In fact, with that understanding, I more smoothly transitioned between my two roles and multiple “communities” because I had my Milwaukee/high school friends and coworkers as well as my newer, college peers. It was an excellent experience. I wouldn’t say that I was surprised by anything she experienced, but I would say that I bet it made her a better teacher. I’m not sure how much was touched on in that area (as of yet), but I think understanding a population is a giant leap towards better teaching and learning between the two parties. Andrew- If you had it to do over do you think it would have changed your college experience had you moved into campus housing freshman year? I’m curous because I have a son. my third to go to college, but the first planning to go away freshman year and I just wonder what your perspective is? I agree that understanding the student population leads to better teaching and improved learning. Too often, while at the community college, I heard things that bordered on the ridiculous specifically from faculty teaching students in remedial courses. I figure that when one person agrees to teach a “How to write a paragraph” course – the anecdotal title to the first English course in the remediation sequence – it would be expected that these students do not know how to write a 10-page paper. Badgering and abusive name calling are not exactly motivators; the students in these courses varied in age, some had been out of school for decades while others had recently graduated from the local area high schools. Maybe getting to know the students and the reasons why they found themselves in such a basic course would improve results. I wasn’t too surprised with Nathan’s results. When I started at CSUB I made it my mission to be as involved as I possibly could. I always took more than 15 units, often held more than one job–the majority were on-campus jobs, and also did research in the chemistry department. I also worked for the school newspaper, was president of a STEM club, performed in the school plays and musicals, and was part of ASI. All of this said I had the opportunity to have a really great and involved college experience. However, I did notice that was not the case for the majority of the students. I noticed that the majority of students came to take their courses, were not always focus or engaged, and left the campus. Just as Nathan said, it is difficult to build a culture when not all of the members are in the same place. I guess I am trying to say that to me it seemed like their was a lack of a college culture for the majority of the students who just commuted to campus to take their courses and then left to go home or go to work. As part of ASI we tried to create events during different parts of the day to keep the students on campus, involved, and motivated academically and socially. However, this was a difficult thing to do because of the students’ need to hold a job off campus or other family related circumstances. I agree that the lack of student involvement could be a result of a lack of college culture. Some campuses have a strong school culture while others do not. I was able to observe and participate in such experiences with my friends that attended other colleges. What steps do you feel that college campuses could use to promote and achieve strong a strong school culture? You mention that as part of ASI you were able to see first-hand how difficult it is to actually get students to participate in activities because of their need for off-campus jobs or family related circumstances. Looking back on that experience, what do you feel would have been a turning point for students? What programs, activities, opportunities??? I was a disengaged student. There were so many issues that I had to deal with process-wise from the onset that I felt no love for the campus. The times I did participate in any activity had more to do with my friends asking/begging me to help them. I did it for them, because I cared about them, not for me. Did I benefit? Sure, but inside I was kicking and screaming. There was no advisor/mentor that I could turn to and as such made my own way looking for critical advice from friends who, sadly, were in the exact situation as I. This is one of the key realities that drives my passion for assisting students. To this day, I do not have fond memories of this setting and I try to use that experience to change a current student’s outlook on the whole university experience at CSUB. Any suggestions are welcome! 1. For most of my undergraduate education I was an athlete, and like Rebekah found in her research, I socialized mainly with students very much like myself -other athletes, because these were the people I encountered and related to the most. However, my experiences in graduate school and in the work force were much different, as I was drawn to the “different and unique” thinker- the people that had an authenticity to them. Even now, I tend to have friends that are very much like me, and I have other friends that are very different. This is not a concsious effort on my part or in any way contrived- I really enjoy the richness both the “sameness” and the “different” brings to my life. 2. I do love my individuality and my privacy, but I believe creativity and global views of the world require collective thought. I think college students for the most part are a bit insecure, thus over time, when they have developed a more concrete sense of self through their education and their experiences, this individulaity will be balanced with the need to search out the “other”. I am more worried about the students/citizens that don’t go to college-as their perspectives might stay insular, and individualisitc for the entire course of their life. 3. You need quite a bit of charisma and gravitas to pull off the one man show schtick. I think using a variety of teaching stratategies in a college course is just as important to include as it is at the elementary/highschool level to ensure student engagement and learning. 4. 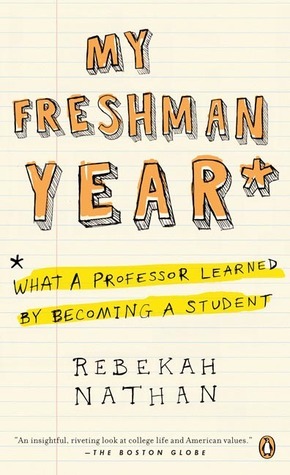 I am a bit surprised by Rebeekah’s findings as I was under the assumption that there was a great deal of community felt in the freshmen population, especially the dorm living crowd. There is still a collectivity for the most part with freshmen, it’s just a bit more selective, inclusive, and secluded than I surmised. I don’t having any positive feelings toward this book. This is a 50-year-old woman living in a dorm full of 18-19 year olds. Is it any wonder that she did not feel the inclusion or a sense of community? She mentions her shock about the lack of activity during the Super Bowl. Yet, once she began walking down the dorm hallways, there were people filling dorm rooms. Just because she did not get invited does not mean there wasn’t a community under her nose. I think a study from a person that can pass for an 18-19 year old and one who is willing to share the living quarters would yield more insight. 1. I attended one year of college and then got married at 19. Many years, many colleges and four children later I returned to school full-time while working and raising my sons. Fast forward 12 years, four college degrees, two credentials, two clear credentials and current enrollment in this Ed. D. program, I would say that my college experience would bot be considered a “typical” college experience. 2. Unfortunately, I would say that the individualist nature probably applies to me more than it doesn’t. I feel that is the way it is for most of our college students as well. For the most part we are all more comforatable staying within our “comfort zones” and socializing with those that we know. It seems that maintianing a small group of friends is more of a priority than becoming part of the larger community. Again, this could just be my perspective, I made choices that kept me from living the “college life”. 3. I know from experience that I felt that way teaching middle school. I felt like I had to being my “A game” every day to keep those students engaged. 4. I wouldn’t say necessarily “surprised” but confirmed suspicians about how different college life is for each individual student and how out of touch the faculty may be with the students’ perspective. If they were truly connected there would be more “connectedness” with campus life, orientation, procedures and processes in general.